So my warriors of chaos will be posted here too - they are all going to be nurgle. 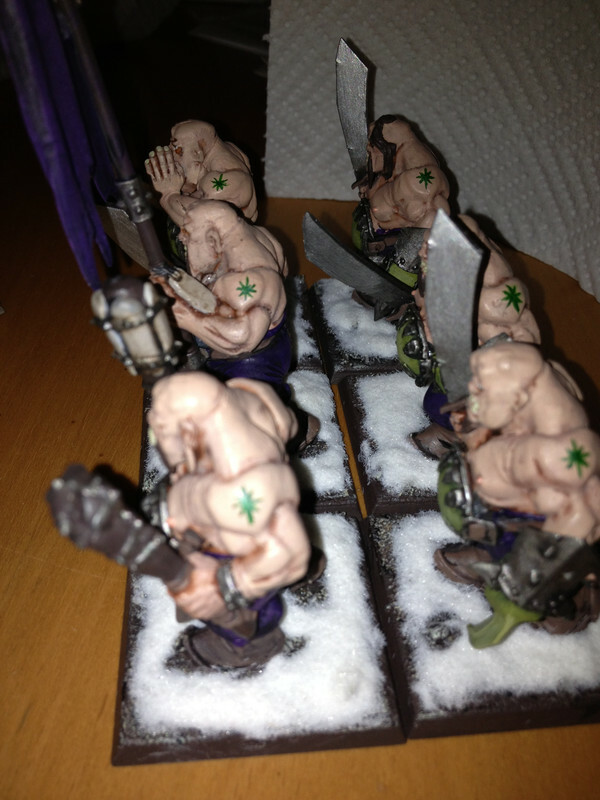 Green with purple cloaks, rather than mutate the marauders and ogre bulls (which I will be using as chaos ogres) I will instead make them look like they have been hired merceneries who have painted their skin. All cloth/cloaks will be done in purple as this always contrasts green nicely. 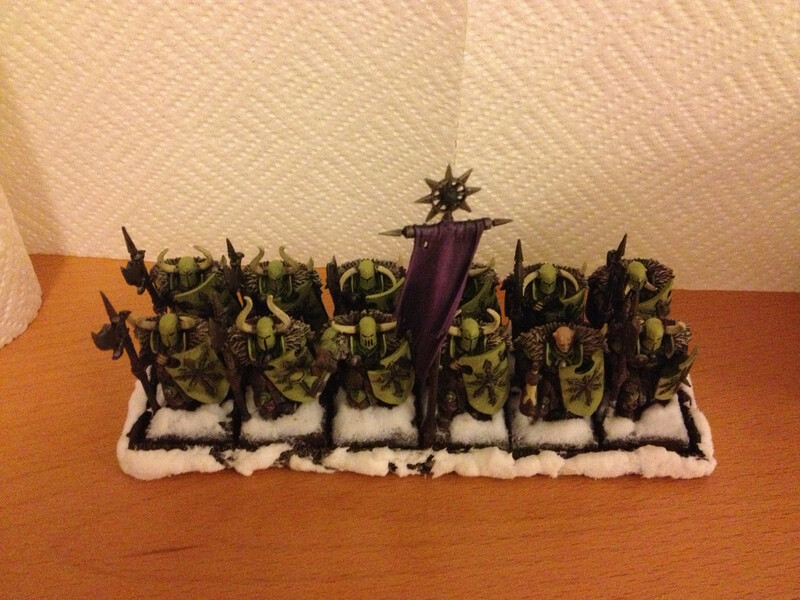 The bases will be snow/winter themed hence why my warriors wear thick fur cloaks. It occured to me today while painting however that our models are designed in green and reproduced in grey, we convert them with green only to spray them in black and paint them green again... stupid cycle!!!! Last edited by Andrew_uk on Fri Oct 21, 2016 9:39 pm, edited 27 times in total. Nice one. Nurgle isn't that common, is it? Mono god isn't common, but you'll just be theming the models right, not the list? Themed lists are so much better! But andrew, by spring that list probably wont be usable anymore if the book (as rumours point to) comes in march-april. A new book might make a mono Nurgle army even better. Both true, but also purely speculation. 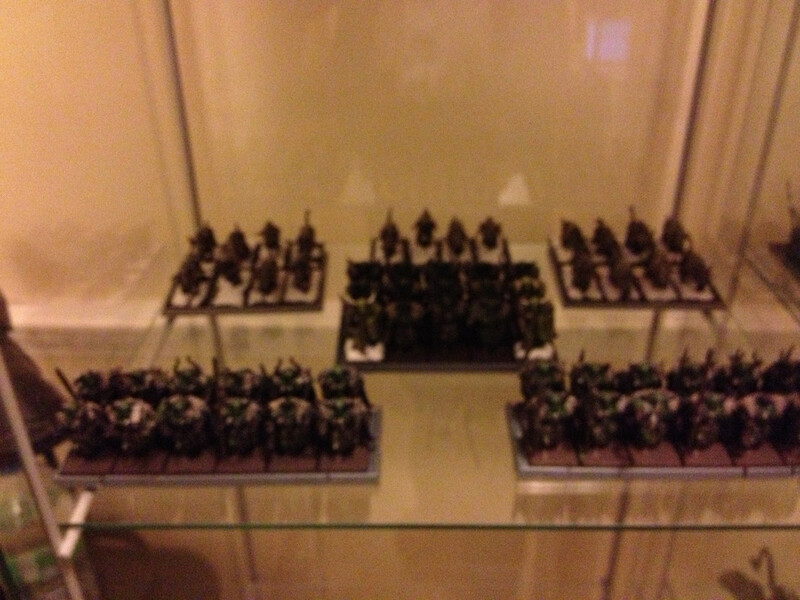 I want to have a 2.5k army (the above list) which is legal and which I can play with at a local store. However my normal opponent is my brother and when we play games at home we use 7th edition with our own rules improvements. It works well and we have made lots of adjustments to the main rules set and some additional adjustments to books. We both feel that 7th edition was not a perfect game, but it was essentially a lot better than 8th and so makes a better starting point. It forces players to pick a more varied core and makes the core more flexible and also gets around the problem chaos normally have of having no shooting units at all. I don't think these changes are unreasonable and paying 8 points per model for a BS3 S4 shot which can't move isn't too cheap. That seems to be the netlist. Make chaos warriors require marauders, the few people that do fluffy archon horde armies wouldn't be able to, and I would be left facing the netlist above over and over again. Basically, I am glad the army of the north is still an option. I am sick of marauder hordes . Note: I think the problem with 8th is the presence of 7th ed book in 8th ed warhammer... it shoehorns people into a few builds. 8th ed books in 8th ed warhammer I think is the best thing that has ever happened to the game. Aside from ogres, all the books are balanced within the rules, and most units are totally usable in all new books made so far. Anyway, like the paint scheme so far! Keep it up! Looking forward to seeing the army develop! True more or less, though I've seen other builds do well. I'm not aiming for out and out broken lists though. And the restrictions and amendments we are putting in place are for our own improved version of 7th as opposed to 8th, I think the way 7th used to work I almost never saw marauders (who needed hoardes of S3/T3 then???). I may well paint up 30 Marauders of khorne just so I can throw them in as and when but I can't see them hitting the table much. 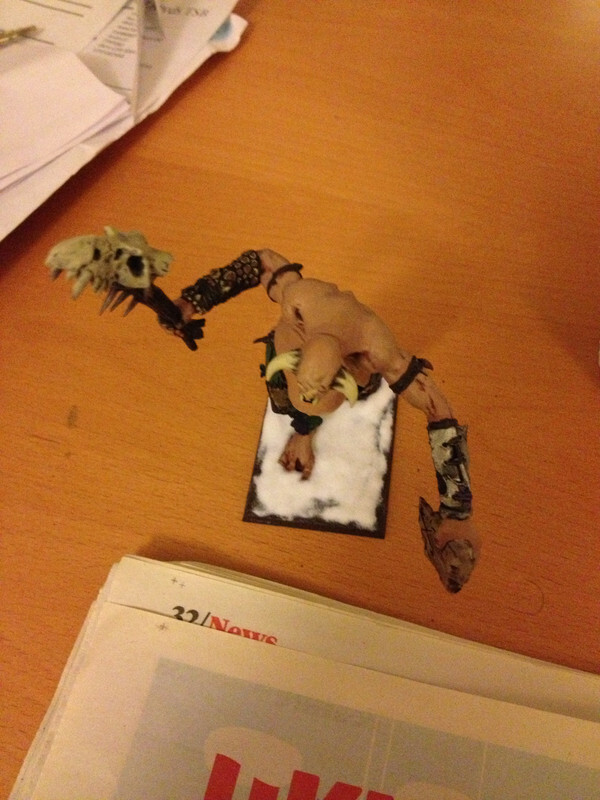 A L4 Tzeench Lord on disc will probably be done at some point for the same reason. Cool stuff Andrew. 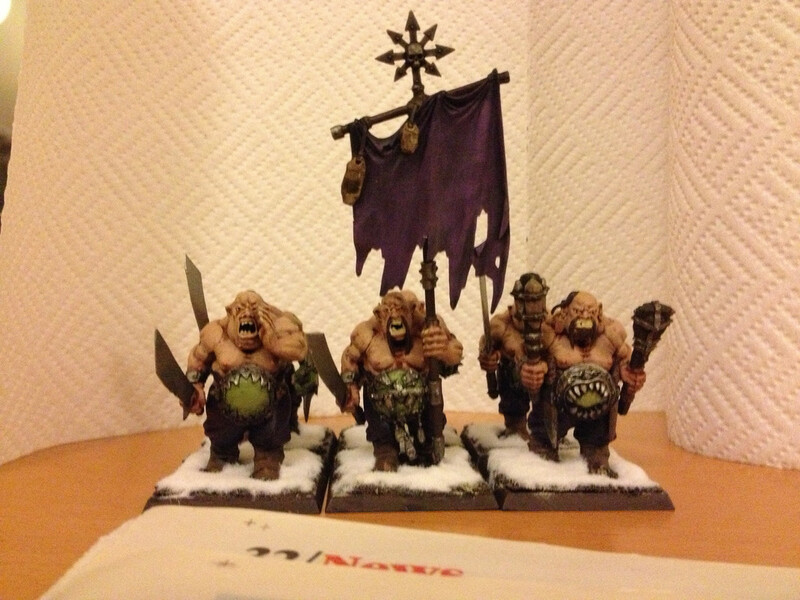 I'm starting my own WoC army as well (its the old jump. HEs to WoC). 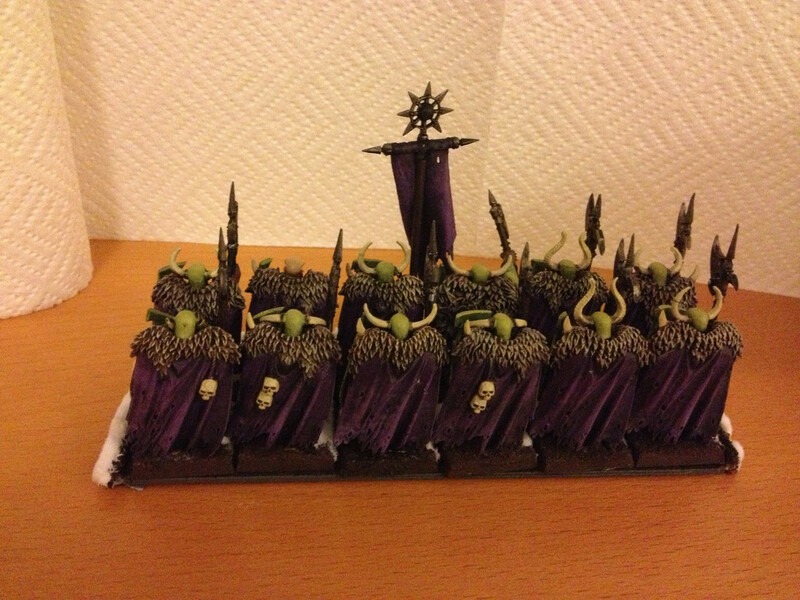 I'm going Slaanesh theme (not list, just models) and basing it around good old warriors as well. 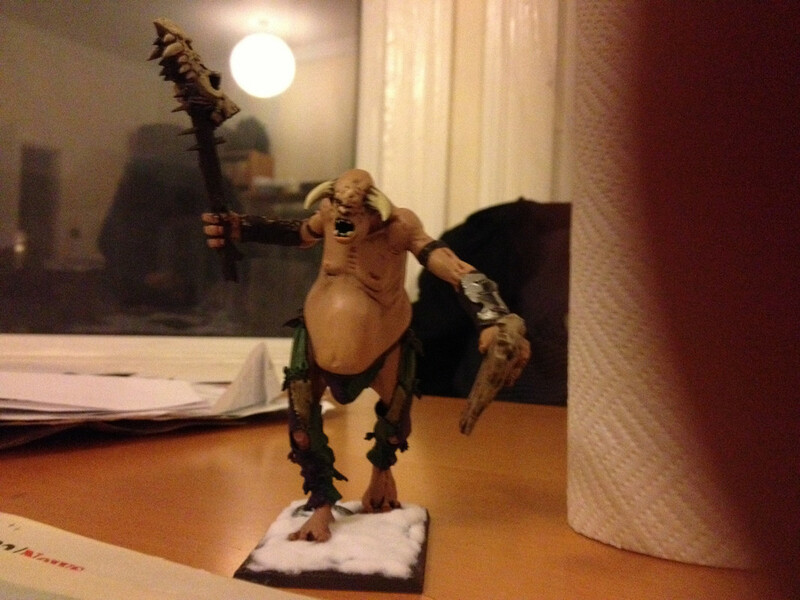 Looking forward to seeing more from Papa Nurgle. Last edited by Andrew_uk on Tue Jan 29, 2013 11:27 pm, edited 1 time in total. You got them in time for the surprise new book release =). 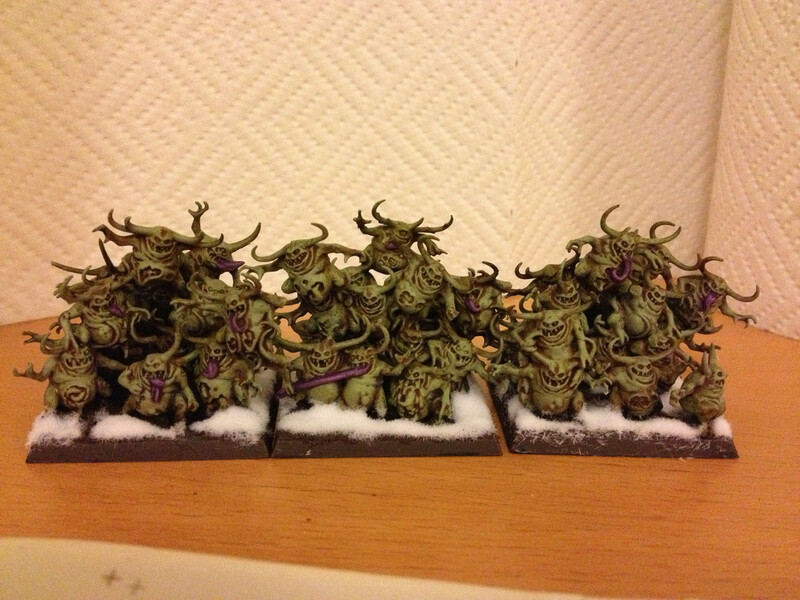 Doesn't look like there are any specific Nurgle troops. Those monsters look hideous too I think. While I'm not nearly as filled with ragehate at the new WoC stuff as some on the net, I never really planned to use many stock models for my WoC anyway. I think thats the whole big appeal of the army for me, the complete blank slate. For instance, I don't mind the forsaken (price is high, of course, but considering what I spend on display board supplies and resin bases, to complain about the cost of models seems hypocritical), but I've already planned a conversion for them that a) makes sense and b) fits MY chaos army. It will probably be cheaper, but whole unit conversions are rarely as cheap as people think they will be. Like yourself, I'll be doing my own ideas for stock models. Trolls = Werewolves again, probably. Though I probably won't ever use them. HOLY CRAP! I googled it. Wow...that thing SCREAMS Nurgle. Good pick! What about making it look like it burrowed out of the ground? Bury the back half in a pile of rubble? For crew, unless you are really tied to the dwarf idea, why not just use a few marauders or chaos warriors? Slightly different tack but... where did you get your glass cabinet from? 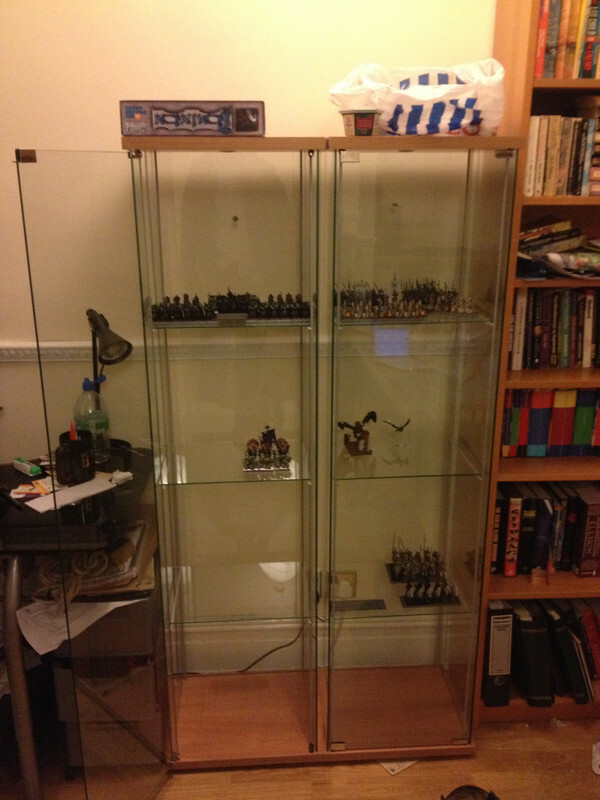 Ikea it's called Detolf and was only £40 each which equates to about $64... I got 2 and reckon you can fit 6,000 points in each without it being cramped. I have about 2000 points of my high elves painted so hopefully I'll fill up the right hand side as soon as I'm finished with the WoC... The chaos are just a much faster paint, my drybrushing and less details, plus I decided to do the entire HE army in NMM which takes like 3/4 months per unit whereas the chaos I've been painting a unit a month!!! hey guys, if you get those IKEA showcases i recommend you to add them some extra shelfs welding metal rods with just small tacks to the orginal steel frame. I did it to mine and doubled the amount of shelfs on it. You need to prepare the steel frames before assembling, of course. Finally just buy the crystal shelfs and ''voila''. hey guys, if you get those IKEA showcases i recommend you to add them some extra shelfs welding metal rods with just small tacks to the orginal steel frame. I did it to mine and doubled the amount of shelfs on it. You need to prepare the steel frames before assembling, of course. Finally just buy the crystal shelfs and ''voila''. I'll probably get back on to the high elf stuff in 6 months or so; the archers and dragon are nearly finished there and then I have about 20 Dragon Princes to keep me entertained for several months! Haha, you might just want to get rid of the marauders altogether, as they're not as good now, are they? 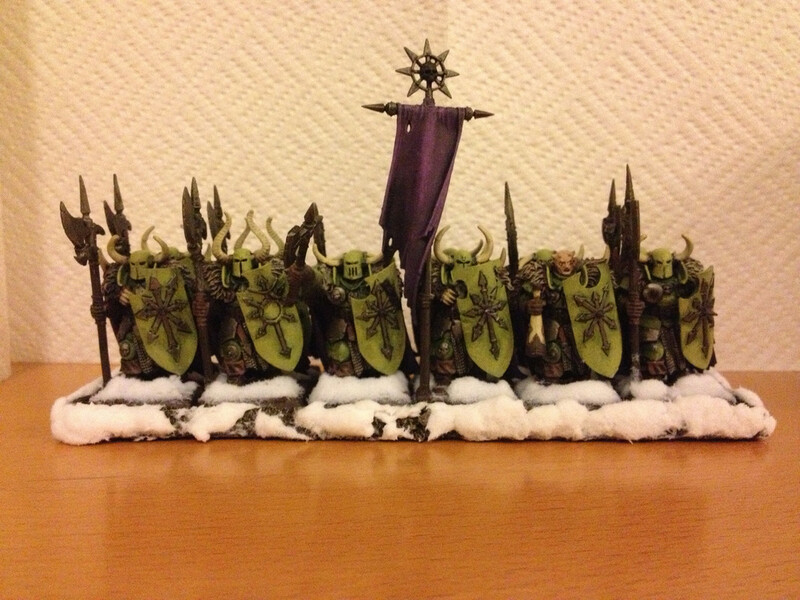 Only a few more months to finish the warriors of chaos then? Wow, they must be quick to paint! I'm really annoyed with myself as I found somehow my superglue ended up with a hole in the bottle near the neck and its spilt a bit over the table I've managed to get most of it off but it's left a mark, think I might have to varnish it. Irony is I always put newspaper down to paint/glue but this happens when doing neither! Very snowy! The color scheme looks good.The lime green and purple are a good pair. Love the green also. Lime is so rarely used. Kudos! Do you have a list in mind with the new book at this point or did I miss it.